The Observer has placed the “Bankers to party on Trinity Square Gardens” that I broke here on Thursday on its front page today and the article’s author, Nick Cohen, has also devoted his column to the issue. I’ve also done a piece on page 12 of today’s Sunday Express and there was some discussion about splashing on it. It’s one of those stories that beggars belief. Richard Beggs, the managing director of caterers Moving Venue, which has lodged the licensing application with Tower Hamlets council, called me on Friday to try and justify the project. He said the war memorials “were extremely dear to our hearts”, that he would provide security, and that they are walled off and in a separate area with their own entrance, the last bit of which is essentially hogwash. Mr Beggs also revealed they had been in discussions with officers at Tower Hamlets council for six months and they had been extremely supportive of the idea. He said the council would be receiving an undisclosed but sizeable income stream from renting out the space, which he said would be useful for Britain’s poorest borough (well, gee, thanks!). And he fervently hopes Mayor Lutfur Rahman will be attending a lunch with him to celebrate the swish new marquee. When the proposal to close Bancroft History Library and Archives was aired in 2008, it was clear that many people in the Town Hall were neither aware of the incredibly rich history of Tower Hamlets nor, frankly, cared. We won that battle but the history lesson doesn’t seem to have sunk in. Earlier this year, when residents and some councillors, including Labour leader Josh Peck and the Tories’ Peter Golds, complained about the number of events being staged in Victoria Park, Lutfur acolyte Rania Khan – the council’s culture spokeswoman! – brushed them off as the moaning white middle-classes. She effectively said that money was more important that tranquil green space and heritage: that the various music festivals, which helped ruined the park again this summer, generated wads of cash for the council. Well, as Mike Brooke from the East London Advertiser reported last month, the nine events staged there this summer netted just £250,000 in income. Half of that amount has effectively gone on refurbishing Lutfur’s office and his new Mercedes Lutfurmobile. I’ve no idea what the council is hoping to grab from Moving Venue but whatever it is it’s irrelevant. As Nick Cohen says in his column, there are some things that can’t be monetised. I’ve neither any idea what Lutfur thinks about Trinity Square Gardens but his past record suggests not much: he failed to turn up at last year’s Remembrance Sunday service there without telling anyone why at the time. However, he now has a chance to redeem himself by telling Moving Venue that their idea is rum, to say the least, and that they should withdraw their application. Anything else would be like dancing on the graves of the Commonwealth war dead, including those of the many Bengalis who died serving the merchant fleet. “You can’t plant an all-day bar, dining room and disco on top of the war memorial and expect the due reverence to be untainted. Can you imagine 350 people spilling out of there? 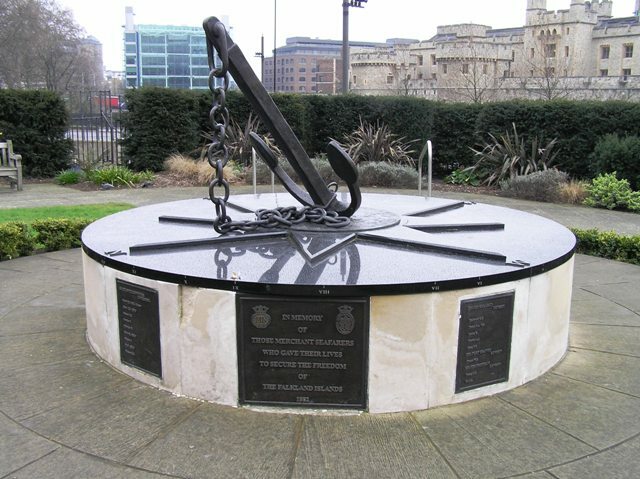 The proposal to hold parties in Trinity Gardens is an affront to the thousands of merchant seamen who lost their lives in times of conflict. It was possible to join the merchant Navy aged 14 and the magnificent memorial commemorates, amongst many others, these youngsters who gave their lives. A party in a Marquee will involve drink and noise. A prime reason for rejecting a licensing application is disorder, and the potential for disorder around the Memorial is extremely high. The proposed date for starting these events is November 22. On November 13th Trinity Gardens will be the setting for the Borough’s main Remembrance Ceremonies. How appalling that wreathes will be removed to be replaced by canapés, champagne and fairy lights. The current Tower Hamlets administration has form on this matter. Last year, despite a seat being reserved for him, Lutfur Rahman declined to attend the Remembrance Ceremony. His administration blocked off large parts of Victoria Park for money making events in the summer and his officers are supporting a new Hotel on Trinity Gardens – despite there being no facilities for deliveries. Something needs to be done and Lutfur Rahman needs to understand that One Tower Hamlets means actions and not press releases. I can see this issue building a serious head of steam.